COVER: A stylized pineapple from the old German garden-book, "Heinrich Hessens Teutscher Gartner," Leipzig, 1724; courtesy, Walter Voeth. STAMP: This postage stamp from Jamaica, showing two pineapples, indicates the importance of the fruit in the economy of this British West Indian island. At the annual meeting, held October 25th, in Los Angeles, California, new officers of the Bromeliad Society were appointed. David Barry is now President. Frank Overton is Vice President and Editor, while Ben Rees takes over as Treasurer; Victoria Padilla retains the post of Secretary. 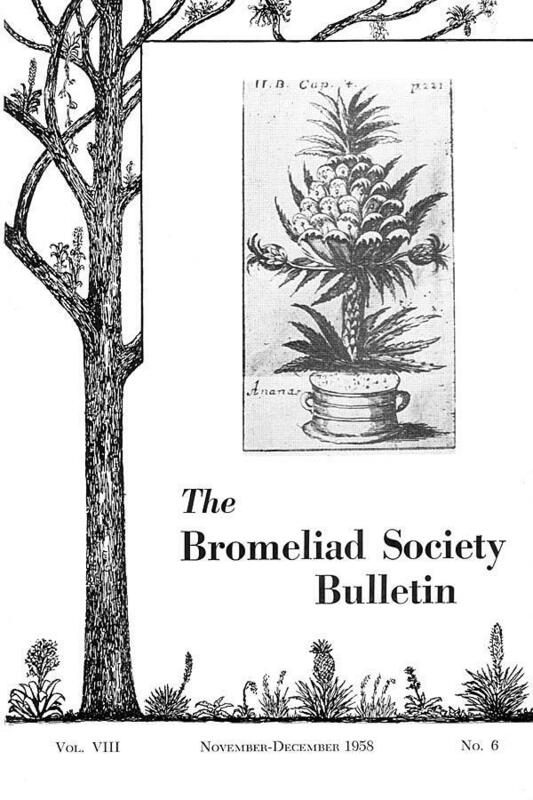 The responsibility of The Bromeliad Society Bulletin has long been an overtaxing one for both Racine and Mulford Foster. Although the publication is small and appears to have a minimum of work in connection with it, the extra time and energy that it involved made it necessary for the Fosters to give up this extra work. We will carry on with some bromeliad writing, and of course, other work with bromeliads, but for a while – perhaps a year – we would like to feel less responsibility than the last few years have allowed us. We are happy that Mr. Frank Overton has accepted the responsibility of editing the Bromeliad Bulletin. We hope that everyone will show their approval by sending in a stream of articles, photos and interesting news items that will keep him well supplied with material on the subject of bromeliads. May we both, personally. thank each and everyone who has contributed to the Bulletin, as, of course, without ever one's cooperative effort the Bulletin would have ceased long ago. We wish to express. heartily. deepest thanks to Victoria Padilla, the Society's loyal and time-generous secretary, for the endless details which she has handled to keep the machinery of the Society functioning. To David Barry the past Vice President and Frank Overton, the past Treasurer. our most sincere thanks. Appreciation also goes to the Directors who have given valued assistance. Flood him with articles and photos. encouragement and best wishes–it is not an easy job. We all wish to see The Bromeliad Society grow and the Bulletin to expand along with this growth. It has been our studied observation that interest in bromeliads has risen markedly during the past twenty years and that the family is on the threshold of a great horticulture future. We sincerely regret the late publication of many of the recent Bulletins; we are pleased that this is the last issue of Vol. 8. Do not be disturbed if the first issue of Vol. 9 appears before No. 6 of Vol. 8. It will be our way of trying to catch up with the calendar. "HEINRICH HESSENS TEUTSCHER GARTNER" published by Thomas Fritsch, Leipzig, 1724. This plant unknown in Europe, he has met in Brabant (a Dutch-Belgian province), in Agin and in Holland, in the garden of the Prince of Orania to where it was brought from Brazil and from the Canary Islands. This plant is not a tree, but a bushy herb, with low stem and much resembles the thistle. Two spans (old German measure) over the stem, the pineapple bears very many narrow leaves out of which very long stalks come forth, on which fruits are hanging in form and shape of small lemons, which are bearing on their top, narrow yellow-golden leaves and which are sweetly smelling. In the middle of the pineapple there is a big apple (therewith is meant the fruit) and round about there are many young ones, so as a father would have very many sons who are growing on with him. The pineapple is a very gay looking plant, and is an ornament for any garden. 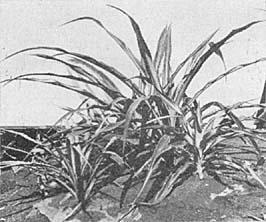 Furthermore, the author reports after his own examinations in a bucket, where the pineapple was standing, that its few roots resemble those of a melon; they were spreading in an earth-mixture of wood and sward with coarse sand and a little dung-earth in addition. On the earth, around the stem, there is to be put moss in order not to become dry. Furthermore, the plant is to be watered only with pond water, heated by the sun. Then, before winter begins, the pineapple is to be placed in an airy, warm place (presumably a hot-house is meant) and is not to be put out into the garden before June. When outside, the pineapple should get a place with hot, south-side-sun, being also protected from north and east winds. The pineapple lives no longer than eight to ten years, therefore it is necessary to draw on new plants from seeds of apples which are gathered from India (therewith the West-Indian Islands of Middle-America are meant) and brought to Europe. The seed of the pineapple looks like brown seeds of lemon, and before planting they must be put into water for one day; before they get dry they are to be put three inches (Zoll, old German measure) deep into the above mentioned earth in a big pot. If kept warm and diligently watered, the seeds germinate within a month, but the little plants are not be replanted for some time. Every second year, the earth above the roots is to be removed and is to be replaced by new earth. If the pot becomes too small for the pineapple, only in June is it to be replanted, after the roots are re-cut beforehand. After this, there is so long to be watered with a mixture of wine and water, until the pineapple begins to grow afresh. The fruits of this pineapple resemble, in their shape, a lemon. They are dark, golden yellow and have a pleasant scent which is so strong that one can smell the fruit outside the house wherein it is kept. The fruit is crowned by a bunch of yellow blossoms and leaves; it is juicy and very similar to an artichoke (Cynara scolimus) without pricks. Also the roots and white seeds resemble those of the artichoke. The seed must be sown into fat, slack earth; the germinating little plant is to be cultivated in a warm hotbed and should hibernate in a dry, warm, airy house. During this time it is only very little to be watered. The author goes on in his account that he has seen and eaten of the fruit of this Ananas sinensis in Holland. It tastes of strawberries which are cooked with wine and sugar and which melt on the tongue. Also, one must, if intending to eat pineapples remove the outer shell (skin), cut the rest in slices, lay them into wine and water, in order that the burning taste may be removed, which causes pustules. A special picture was planned for this space, but difficulties of reproduction made this impossible. It was to be the painting which shows the first pineapple grown in England (in 1680) being presented to Charles II by his gardener, John Rose. A colored reproduction of this significant painting appeared in LIFE magazine, Nov. 19, 1956. Also, the same painting was reproduced in black and white in the book "Men and Gardens" by Nan Fairbrother, (Alfred A. Knopf, N. Y. Publisher). That it was a rare fruit at the time is emphasized by the fact a painting was made to commemorate the event. This painting now hangs in the Victoria and Albert Museum, London. One hundred years later, in 1779, William Speechly, Gardener to the Duke of Portland wrote, "A Treatise on the Culture of the Pineapple . . ." This seems to indicate the growing importance of the new world delicacy at least among the aristocrats who had hot-houses. This is a quaint and fascinating book which the Fosters prize among their other rare bromeliad books. Economic botanists have commented upon the fact that all of the major food producing plants of both man and domestic animals were developed or domesticated by prehistoric man. The pineapple, although not considered a major food plant, was also developed or domesticated by prehistoric people of America. During their long association with, and use of the pineapple these prehistoric people acquired a store of knowledge about the therapeutic and other specific qualities of the fruit, some of which they passed on to the European people who came to America after the eventful year of 1492. One of the first things the early Spanish visitors learned concerning the Indians' use of the pineapple was about the wine they produced from its juice. They remarked that while it could not compare with wine produced in Spain it was, nevertheless, good. The historian, Oviedo, about 1520, reported that the pineapple had the effect of stimulating or arousing the appetite. He said, "I do know it rouses the appetite. There are many people who have a disgust for food, it restores a healthy appetite and stimulates them to endeavor to eat, restoring enjoyment." Other writers during this period also mention this characteristic of the pineapple. Research studies made in modern times have substantiated this statement and show that the Indians had discovered this attribute of the pineapple sometime during their long association with, and their use of the fruit. André Thevet, who traveled in South America during the early exploration period reporting, about 1558, upon the qualities of the pineapple wrote that "the fruit of which the natives of America make the greatest medicinal use is called the nana." This was the Indian name for the pineapple. The name by which we know it was applied by the Europeans who came to America after 1492. Other historians have reported that the fruit was used for correcting disorders of the stomach and one made the statement that "it is a great cordial to fainting spirits and helps a squeamish stomach." Modern studies have shown that the fruit contains a chemical component, now named 'bromelain' which has the property of digesting protein. This enzyme is present not only in the pineapple but in the fruits of many of the other species in the pineapple family. The name is derived from the word Bromelia, which, as all the readers of this journal know, is the genus name for a host of beautiful and sometimes exotic appearing tropical and subtropical plants belonging to the family of Bromeliaceae. An account of this enzyme has been recently published by Dr. R. M. Heinicke and Dr. W. A. Gartner in a paper entitled "Stem Bromelain," a New Protease Preparation from Pineapple Plants, in Economic Botany Vol. II, No. 3, pages 225-234. 1957. Because bromelain has the property of digesting protein it can be (and is) used to tenderize tough pieces of meat. In fact long before the chemistry of this substance was known, fresh pineapple juice had been used to tenderize meat. Often this was easily accomplished by the simple procedure of placing slices of fresh pineapple above and below the piece of meat a la sandwich fashion and leaving it thus for one to two hours. However, fresh fruit (or juice) must be used, for the canned fruit has lost most of its bromelain during the canning process. Another note regarding the medicinal use of the pineapple we find in the American Cyclopedia, published in 1875, where the statement is made that "the unripe fruit is exceedingly acrid and its juice in tropical countries is used as a vermifuge." Some other references have been found in old literature but this character does not appear to have been studied in modern times. However it may have some factual basis for it is known that some fly larvae are unable to live in pineapple fruits, but are able to complete larval growth in other non-bromeliaceous fruits. In other words, it appears that the bromelain kills the young larvae, probably through its digestive action upon the protein tissues of the larvae. In the canning of pineapples the placing of fruit slices into the cans is a manual operation in order to obtain the proper grade of slices in the respective cans for the fancy, choice, broken, etc., grades of canned fruit. The workers in most canneries wear rubber gloves for this operation and thus prevent human hands from coming in contact with the fruit. This has a dual purpose – first, it prevents any possible contamination of the fruit from the hands of the workers, and second, it protects the workers' hands from the corrosive action of the acids and enzyme in the fruits. A doctor stationed in Southeast Asia during World War II reported that native workers in a small pineapple cannery where rubber gloves were not available, had the skin of their fingers eaten away until they were unable to work for a number of days. These lesions healed in a very short time leaving the surface of the fingers a dark bluish color and without a fingerprint pattern. Several studies have been conducted trying to develop methods for economically extracting bromelain from pineapples for commercial use as a meat tenderizer and in medicine (used as a supplement when the digestive system lacks the ability to digest protein). Bromelain can be extracted but the present processes are too expensive to permit it to compete with a similar enzyme obtained more cheaply from the tropical fruit, papaya. The pineapple fruit also contains appreciable quantities of the vitamins A, B1, B2 (G) and C (ascorbic acid). The quantities of vitamin C vary widely between varieties. In only a few of the less well known minor varieties however, does the amount approach the percentage commonly found in citrus fruits, the usual source recommended for vitamin C therapy. The fact that the American Indians were making use of the medicinal properties of the pineapple is a strong indication that they had been using it as a domestic plant for a very long time in order to have acquired this knowledge. 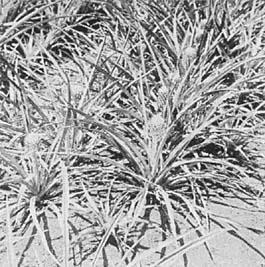 Studies of the species, Ananas comosus (L) Merr., have shown that it consists of a collection of varieties, no single one of which can be considered as the type for the species. They all have certain characters in common, among which is the production of seedless fruits. Because of this, the species is perpetuated by asexual propagation. All other species of Ananas produce seedy fruits and have relatively few varietal forms. The development of seedless fruits must be considered as a result of definite selection by the Indians sometime during that mysterious process of domestication. Also these varieties show heterozygousity, indicating a hybrid origin. The most important commercial variety, Cayenne, is now believed to have been used, and possibly developed, by the Indians living in the upper Orinoco River basin in northern South America, in prehistoric, times. Thus the pineapple, along with the major food plants of the world, must be considered as a part of our heritage from some unknown, prehistoric people who had the ability to develop and preserve these remarkable food plants. Bromelain an enzyme derived from the pineapple plant root, could become a million dollar industry in the next three years and offers great promise in the field of medicine, according to a research authority. The future of the enzyme was discussed Friday by Dr. Ralph M. Heinicke, director of chemical research for the Hawaiian Pineapple Company, before the Engineering Association of Hawaii. Bromelain was first extracted under his investigation. The enzyme, he said, digests dead tissue without touching live tissue, removes scabs to aid in burn treatment and has been successful in aiding dysmenorrhea and X-ray work. It also cleans teeth, improves cake flour, speeds up the curding of cheese, tenderizes meat and digests the gelatine coat on film to recover the silver in scrap film. Its primary function today is chill-proofing beer, he said. Although the bromelain industry is in the pilot plant stage, Dr. Heinicke is predicting development of uses for the enzyme production by-products and a more productive future for the pineapple itself. Many of its uses are still in the investigative stage. Bromelain, primarily a protein digester, is one of a group of proteolytic enzymes on the market. It is hoped that through mass production, the pineapple enzyme may be made more economically attractive than the others. Above: (Fig. 1) A collection of handicrafted pineapples showing difference in size and form. The two flanking the central one are made of wood, the broad crown of which is removable. The others are pottery. Below: (Fig. 2) Three pottery pineapples, two as cookie jars and one serving as large teapot. Pineapples were domesticated in prehistoric times in America and were being cultivated by the Indians in the American tropics long before Columbus embarked upon his world changing voyage of discovery. These native tribes used some of their principal food plants, such as corn and potatoes, as models for the manufacture of domestic and religious utensils. For some obscure reason the pineapple fruit did not appear to be used by them in this manner. Only one reference has been found of the pineapple being used in this way. This was recorded by Acosta in his "History of the Indias" published in 1590, where he describes an object found in Mexico where pineapple fruits appeared as a design on a shield, which he believed had been used in religious ceremonies by the Indians. However, pineapples played an important and interesting role in art and decoration through the centuries following the discovery of America. There are two now famous paintings of pineapples which were produced in England to commemorate specific historical events in the early 17th and 18th centuries. One shows the Royal Gardener, Rose, presenting a pineapple fruit, with a long stem attached, to King Charles II in the courtyard of his country house. The other is a picture of a pineapple plant bearing a mature fruit which is believed to record the first pineapple plant to produce a ripe fruit in England. (Fig. 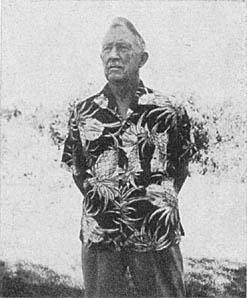 3) The author wearing a sport shirt (in Hawaii known as an aloha shirt) showing the use of the pineapple as a design or pattern. During the late 17th and 18th centuries a number of books dealing with the botany and biology of tropical America were illustrated with full page, artistic drawings designed to show typical or conspicuous biological features of the New World. 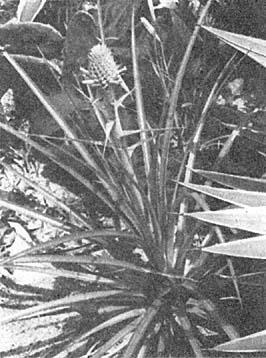 Many of these included pictures of pineapple plants as a conspicuous part of the native flora of these regions. A Dutch artist named Post came to Brazil during that short period when the Dutch government was in control of Brazil, having taken it temporarily from the Portuguese. During his stay of a number of years, he painted many landscape, seashore and village scenes typical of the country at that time. 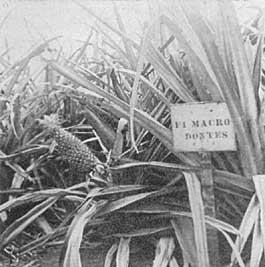 In many of these, pineapple plants were shown as a typical part of the native flora. Some of these paintings by Post are now preserved in art galleries in Europe. 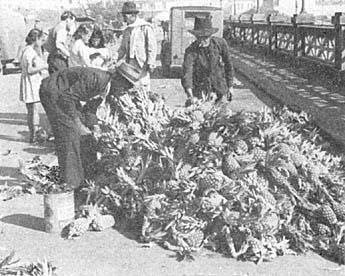 During this early period in the history of America pineapple fruits were imported from the West Indies into England and the Continent and often used as table decorations at banquets and dinners given by the wealthy people of these countries. Sometimes these fruits were used by others for this purpose and consequently the same fruit would grace the table of several people before finally being served as dessert. In this way the pineapple fruit gradually came to be considered as a symbol of hospitality. In this role the fruit itself gave place to an image or likeness of the fruit wrought in metal (usually silver), clay or wood. Pineapples carved from wood were used over entrance doors, and over the fireplace mantels, perpetuating the symbolism of hospitality. These carved pineapples were also mounted at the top of bed posts in the 'heyday' of the large four-poster bed, and as an ornament on other pieces of furniture such as sideboards, chests of drawers, wooden clock cases, etc. Following its earlier use as a specific symbol of hospitality it was given a more general use as a decorative motif on various household utensils and equipment. Many of them appeared in the form of pottery cookie and jam jars, or as a handle on the top of sugar bowls and fruit dishes, which thus contributed both artistic and utility virtues. The pineapple at various times through the years has been used as a design on painted home furniture and for fabrics used in making clothing and draperies. In the earlier part of this period the designs were often so completely stylized that the pineapple all but disappeared. 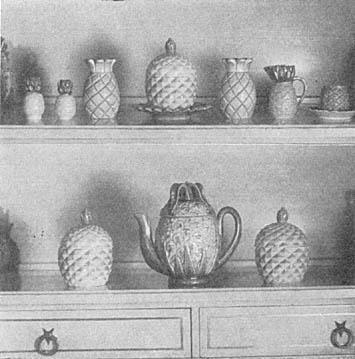 In more modern times the pineapple continues to be used as a decorative design in fabrics (Figure 3) and pottery (Figures 1 and 2) and other household items. At the present time the pineapple has largely lost its earlier symbolism of hospitality but is used largely because of its own artistic value. However, it has acquired a new symbolic significance which has been fostered by the producers of preserved fruit, and the large passenger liners of the Pacific Ocean in their respective advertising media. This new symbolism has to do with the allure and romance of the tropical islands of the Pacific, where pineapple fruits are produced in abundance along with tall coconut trees, fragrant flowers and friendly native peoples. I should not close this brief discussion of the symbolism attributed to the pineapple without reference to one which developed in our country some four decades ago. A symbolism not so pleasing or aesthetic as those mentioned above. This first came about during World War I when the word 'pineapple' was applied to the hand grenade used during that conflict; and in the years following the war, it became a potent weapon in gangster warfare in some of our larger midwestern cities. We are glad to report that this brief period of abuse of the name of this fine fruit is now almost forgotten and we are pleased to remember it first as a beautiful fruit in its own right, and worthy of the fine and beautiful things which it has inspired in both our older and our modern culture. Pineapples in the municipal market at Bello Horizonte, Brazil; such heaps of these fruits are a familiar sight in markets throughout Brazil and other countries of South and Central America. Dwarf pineapple, decorative but not edible. Native to semi-arid regions in Brazil. This is the wild pineapple commonly found in many sections of Brazil; it is eaten by the natives but not grown commercially. Small Brazilian wild pineapple, sometimes eaten, but not considered a delicacy. The leaves are spineless and erect. This is the smallest of all the pineapples. The actual fruit is often an inch or less in length; is very hard and not edible. Botanists end horticulturalists know that the pineapple is a native American plant which had been cultivated by the Indians long before Columbus discovered the new world. All the species of the family, Bromeliaceae, are indigenous to America except one species in tropical Africa. 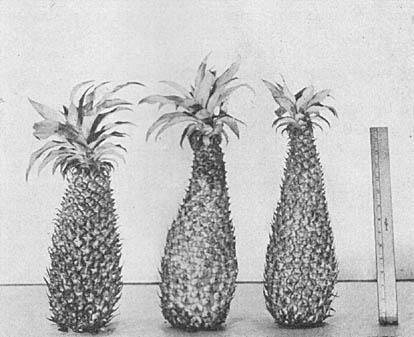 Smith (1955) lists five species of pineapples in the genus Ananas of which A. comosus (L) Merr., is known only as a cultivated type including a number of varieties. The other four are wild species some of which have been cultivated in a minor way but have no commercial significance. These five species of Ananas are interfertile and produce fertile hybrids when crossed. The common pineapple Ananas comosus, variety Cayenne, has also been crossed with its close relative, Pseudananas sagenarius, (Arr. Cam.) Camargo, producing a very interesting fertile hybrid. This paper briefly discusses the general characteristics of these two species and their first generation hybrid. The wild species P. sagenarius was earlier named P. macrodontes, (large toothed) this older name indicating one of the prominent characters of this species, namely large spines, as compared with spines on other pineapple plants. Pseudananas is a monotypic genus which has a geographical range extending from about 27° south latitude in northern Argentina to about 20° south latitude in Paraguay, southern Brazil and southeastern Bolivia. It is restricted in this region to the area along the Parana end Paraguay rivers. ** These areas ere subject annually to periods of heavy rainfall alternating with periods of dry weather. Pseudananas is found mostly in shaded or semi-shaded places in open woodland or shrubby brush land. It is seldom found in its natural range in the open or direct sunlight. Nevertheless it grows quite well under direct sunlight in cultivation as indicated by the garden plantings in Hawaii end Brazil. 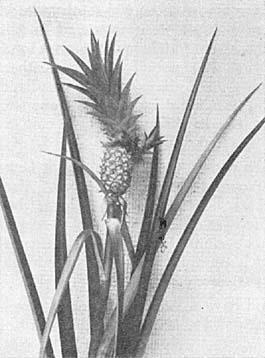 The fruit of Pseudananas is a true syncarp as is the pineapple, but it lacks the crown of leaves which is a prominent character of the fruit of Ananas. 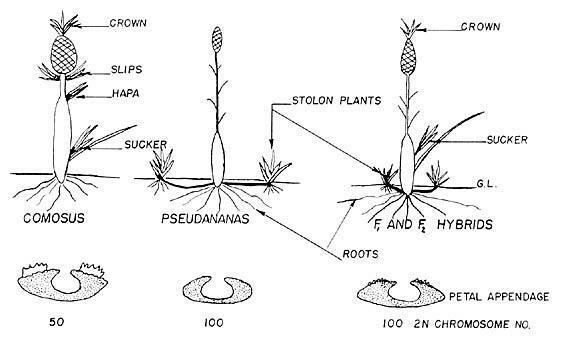 Also, Pseudananas does not produce slips or suckers, characteristic of Ananas, but instead develops underground stolons, from the base of the plant, 2 to 10 feet in length, at the distal end of which new plants develop. Reproduction is accomplished in this manner as well as by seeds which ere produced abundantly in the fruits, in contrast to the seedless fruits of Ananas comosus. The leaves of Pseudananas are longer and have a more pronounced downward curve than is characteristic of most species of Ananas. The whole plant of Pseudananas is larger and more robust than the average Cayenne plant. The bracts, subtending the fruitlets, are about twice as long as those on fruits of Cayenne. 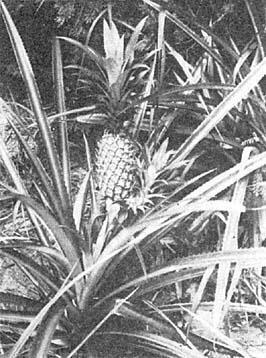 The first hybrids between Ananas and Pseudananas that we know about were produced in 1938 at the Deodora Federal Agricultural Experiment Station in Brazil. 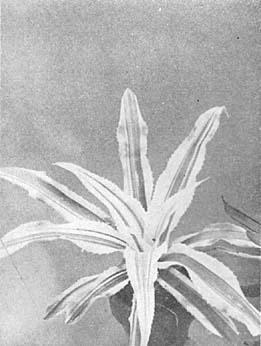 The senior author examined the small hybrid seedlings at this station late in 1938. Variety Cayenne of the species Ananas was not used in producing these first hybrids. The generic hybrid reported here was made in Hawaii using the Cayenne variety of A. comosus and progeny of Pseudananas which had been collected in Paraguay in 1938 (Baker and Collins, 1939). Since Ananas comosus represents a species known only as a cultigen and is considered to be a hybrid origin, its original habitat and geographical range is unknown. The two genera show marked differences in several important taxonomic characters some of which are shown in Table 1 and by diagram in Figure 1. The most conspicuous characters can be listed as follows: A. comosus has a diploid chromosome number of 50, while Pseudananas has 100. A. comosus is self incompatible, Pseudananas on the other hand is fully self fertile and produces seed abundantly, fruits of A. comosus have a crown of leaves at the top while those of Pseudananas do not; A. comosus plants produce slips on the peduncle and suckers (shoots) in the axils of leaves on the plant stem. Pseudananas has neither slips nor suckers, but produces underground stolons from the base of the plant. This latter is a character common in the related genus Bromelia. The seeds of Pseudananas are larger than those of Ananas, yet the pollen grains of the latter genus are larger than those of Pseudananas. The hybrid seeds produced by crossing the two genera are about 90 per cent non-viable, flat, empty seed coats, the remaining 10 per cent plump, well-filled, viable seeds comparable in size with those of Pseudananas. This difference in seed size between Ananas and the F1 hybrid is probably directly associated with the difference in chromosome number, since the hybrid plants all have 100 chromosomes. These first generation generic hybrid plants are of unusual interest for they are fully fertile and when the seeds of the hybrid plants are planted they produce 100 chromosome plants which essentially reproduce the F1 hybrid characters. In other words, a new, constant breeding hybrid type has been produced. As shown in Figure 2, the Cayenne variety of A. comosus produces a few giant ovules (and also pollen grains) which are believed to contain the diploid number of 50 chromosomes instead of the regular 25 chromosomes of normal gametes. The production of diploid (50 chromosomes) gametes by Cayenne is also indicated by the occasional appearance of a few triploid, i.e., 75 chromosome, seedlings when Cayenne is used in crosses with other A. comosus varieties. This indicates the production of both pollen and ovules having the diploid chromosome number, mixed in with the normal haploid gametes. These diploid gametes produced by Cayenne account for the 10 per cent viable seeds obtained from this generic cross and which give rise to the new constant hybrid type. These hybrids then must contain all of the chromosomes (50) of the variety Cayenne, and the regular gamete number, 50, from Pseudananas. These 100 chromosome seeds germinate rapidly and the early seedling growth is more rapid and vigorous than the 50 chromosome seeds produced by crossing varieties of A. comosus such as Cayenne and Queen. The generic hybrid seedlings maintain this increased growth vigor and plant size throughout their period of development. These plants therefore show the phenomenon of hybrid vigor frequently resulting from hybridization of diverse forms, either species or varieties. This increased vigor is also marked in the development of the root system. The individual roots are both larger in diameter and longer, thus penetrating a larger soil area per plant than either the parent species, although Pseudananas has a larger and more vigorous root system than does the Cayenne variety of A. comosus. These generic hybrid plants exhibit some variation such as degree of leaf spininess, fruit and plant size. In regard to leaf spininess, there are three recognizable types viz., non-spiny, partially spiny and completely spiny. For the plant geneticist, these characters indicate some interesting possibilities regarding cumulative action of multiple genes for spininess. A discussion of this, however, is beyond the scope of a brief description of the origin and characters of this stable generic hybrid. The generic hybrid in general appearance resembles the Pseudananas parent, but as stated above, is larger and more vigorous and aggressive in growth. It exhibits a mosaic of the two parental characters, as shown in Table 1, together with other characters so modified that they differ from both parental types. Because of the extra growth vigor of the hybrid and its rapid vegetative reproduction from one original plant, it quickly spreads into a dense mat of thorny-leaved plants which is difficult to control and can soon get out of hand. It would make an interesting bromeliad plant for a large estate but it could soon become a pest in a small garden. While these are interesting plants botanically, the difficulty of control has caused them to be maintained only in very limited numbers in the experimental garden. However, it should not be difficult to produce this F1 hybrid should some bromeliad gardener wish to do so. 1. Very greatly reduced in size. 2. Petal appendage is a generic diagnostic character. and their modification in Fl and F2 hybrids. Fig. 2. Photomicrograph of Cayenne ovules showing 2 giant ovules and others normal size. Giant ovules are believed to have the diploid number of chromosomes of 50, while the normal ovules have the haploid number, 25. Fig. 3. Pseudananas growing in wide spaced planting showing two stolon plants. Stolon on left shows above ground. Fig. 4. Pseudananas growing in close spaced planting. Fig. 5. Plants and fruits of the Fl Hybrid Cayenne × Pseudananas showing long slender fruit and small crown. Fig. 6. Typical hybrid fruits showing elongated upper part of fruit and the small crown (ruler is 15 inches). 1. Published with the approval of the Director as Technical Paper No. 255 of the Pineapple Research Institute of Hawaii. ** In 1948 M. B. Foster collected this species in Baia, Brazil at latitude south 13°, thus extending its known geographical range farther north than observed by Baker & Collins in 1939. * Notes about the authors: Dr. J. L. Collins, Geneticist Emeritus, P.R.I. Formerly (1929-1954) Geneticist and Head of Dept. of Genetics Pineapple Research Institute of Hawaii. Before 1929, Asst. Professor of Genetics, Univ. of Calif.
Smith, Lyman B. (1955). The Bromeliaceae of Brazil. Smithsonian Miscellaneous Collections, Vol. 26, No. 1, Smithsonian Institution Publ. No. 4184, Washington, D. C.
Ananas bracteatus (Lindl.) Schult. var. striatus M. B. Foster var. nov. This variegated form of A. bracteatus may have had a perfectly good name in the past but so far we have been unable to locate it; thus, we are naming it as a new variety. Certainly, the plant has been known for several years in horticulture and is still used as a decorative plant in Europe. In 1939 the writer first saw this plant in the Jardim Botanico in Rio where it was labeled Ananas Cochin-chinensis. (How anyone could have thought this plant originated in the Orient, I cannot imagine.) It has been a part of our collection ever since that time. In the past few years I have seen plants and photographs of this variety from Europe and in all instances they have been labeled as Ananas sativus var. variegatus. Also, the plants of A. comosus var. variegatus are usually labeled A. sativus var. variegatus but I am sure few persons have realized that these two stunning variegated plants were different species – especially if they were not in fruit, and both of them viewed at the same time. The profusion of names, specific and generic, that have been given to the pineapple with its many horticultural forms, notably, of A. comosus, has certainly caused much confusion in trying to straighten out the long history through which this delectable fruit has passed. The writer has gathered the fruit of A. bracteatus in its wild state in Brazil and enjoyed its delicious flavor, regardless of its many seeds, but the original species of our world-wide known A. comosus has never been seen growing as a wild native plant in its original habitat by anyone in recent times. It entered the world of commerce several centuries ago. ANANAS COMOSUS var. VARIEGATUS (Hort.) M. B. Foster, comb. nov.
Ananassa sativa variegata nova Hort. ex Houll. in Rev. Hortic. 42: 232, 1870. A. variegatus Bojer ex Bak. A. penangensis Hortic. ex Morr. A. sativus var. variegatus Hort. ex. L. H. Bailey, Encycl. Hort. Vol. 1: 280, fig. 195, 1925. 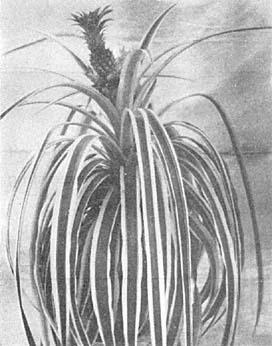 Both Dr. Lyman Smith and the writer have searched many records but have been unable to find that the variegated form of A. comosus has received a legal name since the last combination of Ananas comosus Merrill was accepted. Thus the new combination as above, Ananas comosus var. variegatus (Hort.) M. B. Foster comb. nov.
Mr. Eugen Hahn, of Germany, sent the following notes on the variegated pineapples, as well as the excellent photo of the variegated form of the species, A. comosus. Some of the rarest of specimens grown in West European bromeliad nurseries are the variegated forms of pineapples. In these we have a valuable representative of the bromeliad group, but at this time plants are rarely available in any quantity. The forms of Ananas are indisputably one of the most colorful and decorative species of the cultivated bromeliads. The elegantly recurved growth and vivid coloration will not fail to impress one at any exposition where they are displayed. Not only is the slightly recurved growth an attractive feature, but even more so is the three color interplay of the leaves, the inner zone being green, changing outwardly into rose and corn-yellow. 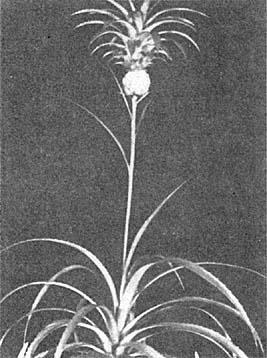 These representatives of the ornamental bromeliads have only one shortcoming, i.e., they cannot be propagated from seeds, only multiplied by offsets; this form of propagation, unfortunately, requires a large number of stock plants grown under glass under West European climatic conditions. This raising of a large number of plants is a slow and costly process.